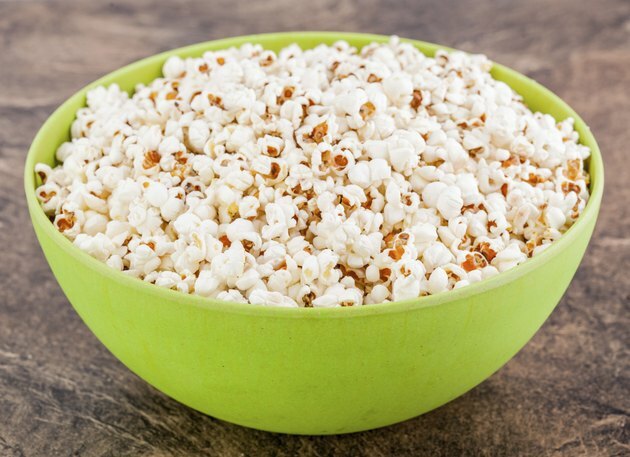 Eating a big tub of movie popcorn smothered in butter may lead to weight gain, but as long as you limit the amount of high-calorie toppings you put on your popcorn, it isn't likely to cause you to pack on pounds. Plain popcorn is low in calories but high in volume, making it a healthy and filling snack. Each cup of air-popped popcorn has only 31 calories. The same amount of home-prepared popcorn popped in oil has 40 calories, and regular microwave popcorn has 64 calories per cup. You can eat an individual serving-size bag of low-fat microwave popcorn, which contains about 3 cups, for just 100 calories. Each tablespoon of butter you add to your popcorn adds 100 calories. Whole-grain foods that are high in fiber, such as popcorn, may actually help prevent weight gain, according to a study published in "The American Journal of Clinical Nutrition" in November 2003. Study participants who consumed the most fiber had a 49 percent lower risk of gaining significant amounts of weight than participants who consumed the least fiber. A 3-cup serving of popcorn has 3.6 grams of fiber, or 14 percent of the daily value. Popcorn is also low in energy density, or calories per gram, due to its high air and fiber content. Replacing foods that are high in energy density with those that are low in energy density can help you maintain a healthy weight or lose weight because their greater volume leads you to feel full after consuming fewer calories, according to the Centers for Disease Control and Prevention. Next time you are craving a salty snack, reach for popcorn instead of potato chips. A study published in the "Nutrition Journal" in 2012 found that people given 6 cups of low-fat popcorn felt fuller than those given 1 cup of potato chips, even though the potato chip snack contained 50 more calories. Those given either 1 cup or 6 cups of popcorn had a lower combined calorie consumption after their next meal than those given 1 cup of potato chips.